The YRSK Medical Foundation-VIBA Hospital is a Non-Governmental Profit Organisation, which has voluntarily stepped forward to address the issue of non awareness about cancer and is committed to the welfare of the cancer patients. We are aware that attention to survivors' issues is as important as augmenting cancer prevention and early detection facilities in the country. Fortunately 55% of cancers can be prevented and creating public awareness and proper education goes a long way to alleviate most problems. A hospital to this effect has been constructed at Oragadam, Chennai, which is at present operational at 10,000 sq. ft while another 100,000 sq. ft. is under way. Experts from all fields of Medicine have being recruited and would include leading Oncologists, Surgeons, Radio diagnosticians, Chemotherapists, Psychologists, Nutritionists, and other National and international faculty etc. to provide the ultimate Hospital technology and Health care to all ethnic, racial and socio-economic groups. Located strategically between two airports and beautifully connected by 6 lane roads from all parts of Chennai and its satellite towns, Oragadam is proving to be the hub of Industrial activity and residential communities of South India. 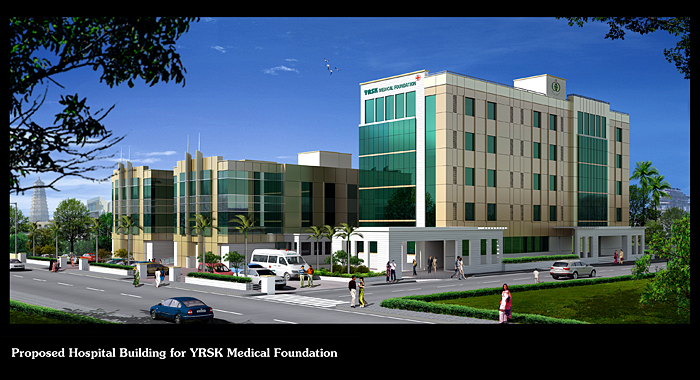 So YRSK Medical Foundation-VIBA Hospital took a thoughtful step and so here we are.